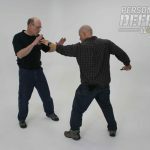 Close-Quarters counterstrike techniques to keep your attacker under control and get your gun in the fight! 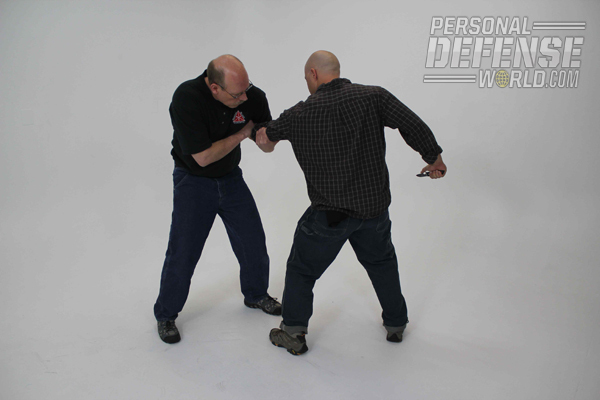 An overarm grip just above the attacker’s elbow limits his mobility and keeps you well away from a deadly knife thrust. 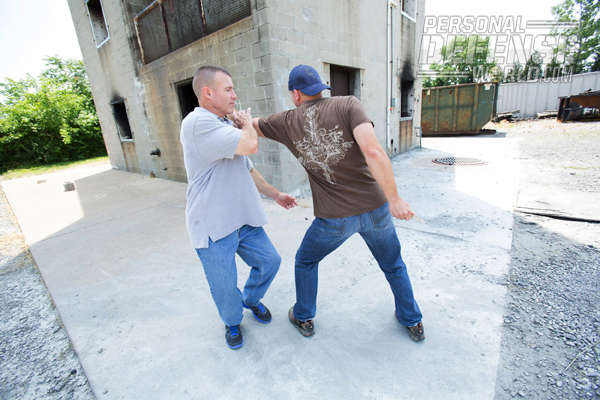 As your attacker reaches toward you with his left hand, use your right hand to guide or slap it diagonally down and to your left before he latches on. Reach your left hand into the space between his left arm and his body and grab the back of his triceps, just above the elbow. Using your back muscles, pull his arm toward you and clamp his forearm under your armpit. 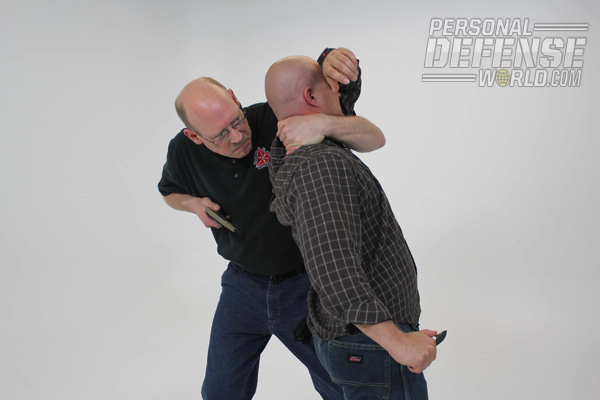 Once you’ve achieved this control, use your right hand to access your handgun and draw it to a strong pectoral index weapon-retention position. 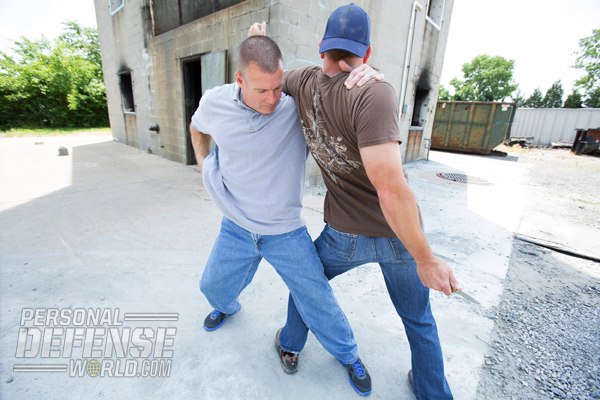 If your attacker is taller, or reaches toward your face with his left hand, reaching over his arm to control it may not be practical. Use your right hand to slap his left hand across to your left. Reach your left hand under his arm and hook it behind his neck. Hold on tightly and use your head for additional pressure if necessary. Then, draw your gun to a solid close-quarters index position and shoot to stop. 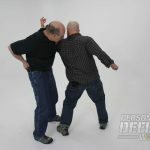 Self-defense basically boils down to two objectives: avoiding (or at least limiting) injury to you and stopping your attacker. 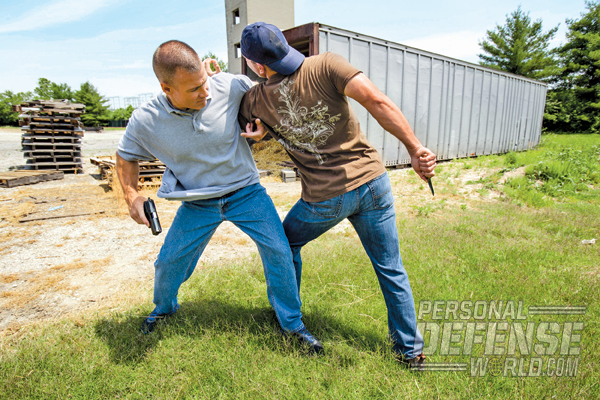 Most defensive-shooting training typically focuses on scenarios that simulate these dynamics at a reasonable distance of at least several yards. Functionally, that distance provides the perception of safety, as well as the time necessary to move, draw, fire and simulate a happy ending. 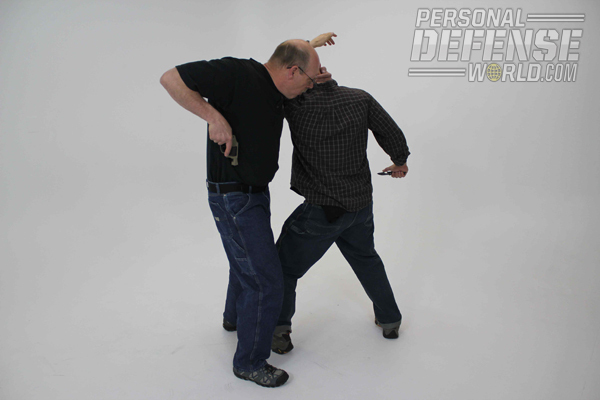 While this may be realistic when representing an attacker armed with a firearm, it is not consistent with the reality of an assault with a contact-distance weapon like a knife or a club. 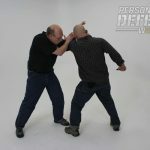 The best way to understand the characteristics of a close-range attack—like a typical stabbing—is to observe actual attacks. 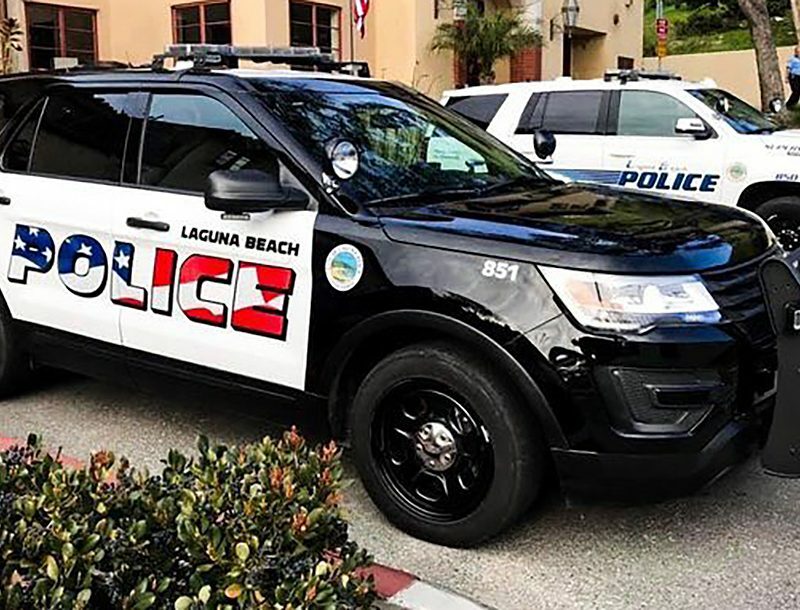 Over the past 10-plus years, I have analyzed dozens of videos of actual knife attacks and have consulted on several incidents. Based on careful analysis, I’ve found that they consistently share the same characteristics: 1) they are initiated at close range; 2) the weapon is often not brandished before the attack; 3) the attack involves multiple, repetitive thrusts; 4) the non-weapon hand is used to probe, gauge, grab and control as a precursor to the knife thrusts; 5) statistically, most people are right-handed. 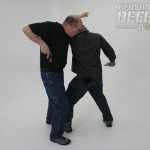 Based on these characteristics, and lots of force-on-force training and experimentation (both my own and that of other respected instructors), one of the most reliable ways of defending against a typical knife attack with a handgun is to first achieve decisive control of your attacker’s non-weapon hand—typically the left. 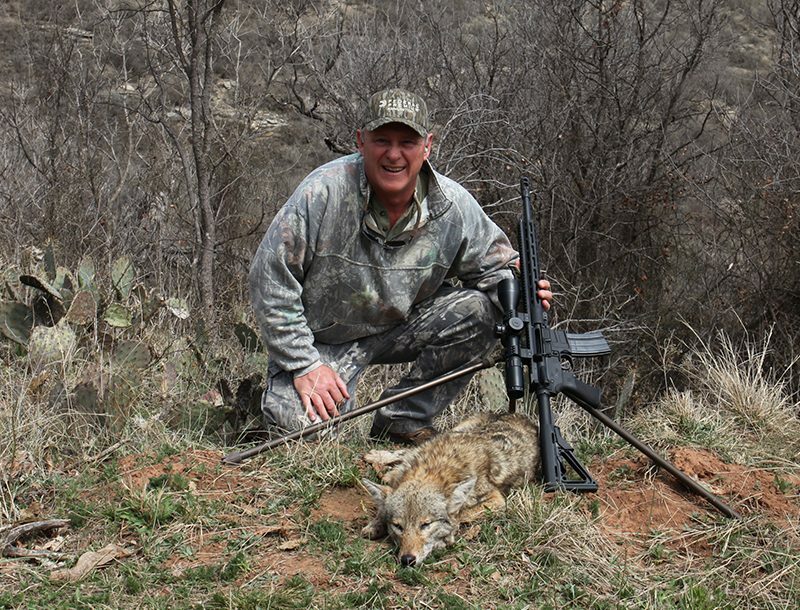 The concept is to use it and the leverage it offers to achieve a short period of mechanical control while you draw your gun to stop the threat. 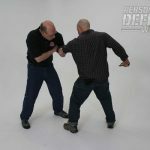 Sometimes known as “same-side control,” this tactic is one that every serious defensive shooter should practice diligently. Let’s consider overarm control first. 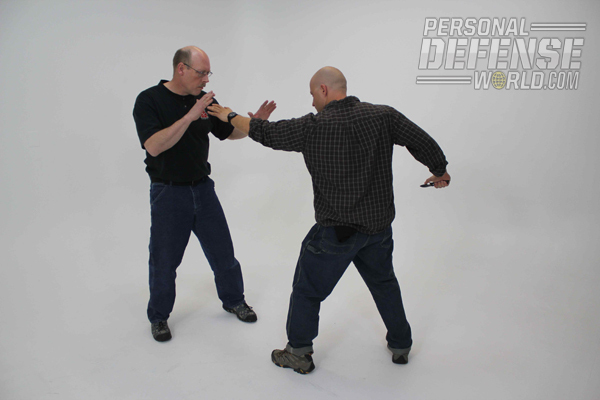 As noted earlier, most knife attacks begin with an instinctive grabbing or gauging action with the non-weapon hand. 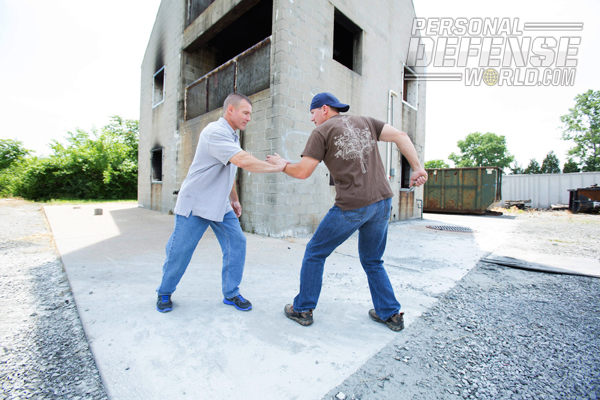 As your attacker reaches toward you with his left hand, use your right hand to guide or slap it diagonally down and to your left before he latches on. Then reach your left hand into the space between his left arm and his body and grab the back of his triceps, just above the elbow. Using your back muscles, pull his arm toward you and clamp his forearm under your armpit. Done properly, this creates an extremely powerful control on his arm and limits the functional mobility of his arm to his shoulder joint. By maintaining your grip above his elbow, he can’t free his arm. You have also positioned yourself to the outside of his body, far away from his knife hand—the safest place to be. 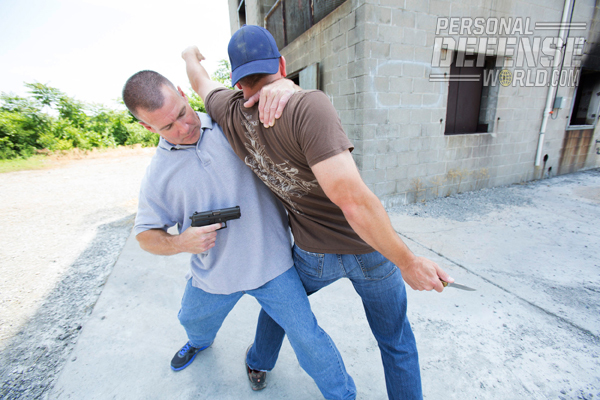 Once you’ve achieved this control, use your right hand to access your handgun and draw it to a strong pectoral index weapon-retention position. 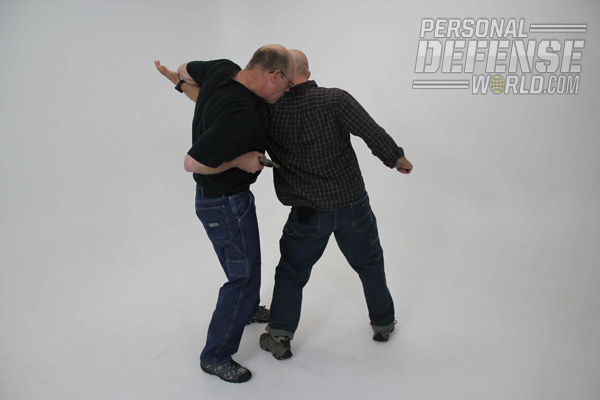 Your right elbow, hand and the muzzle of the gun should all be aligned and angled downward at your attacker’s hip joint. 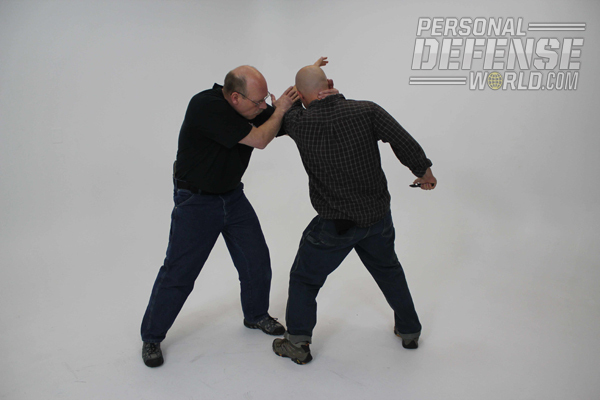 If your attacker tries to reach around to stab you with his right hand, turn your shoulders and pull your left elbow back. This will off balance him, prevent the stab from reaching you and ensure that your left hand and arm are nowhere near your line of fire. 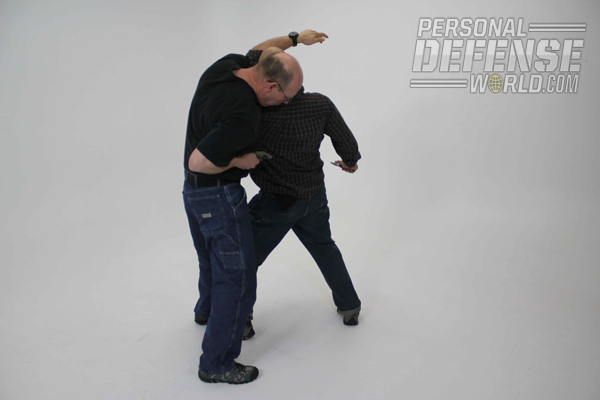 From this position, you can easily shoot into your attacker’s hip joint and pelvis to destroy his mobility. In doing so, you also have the advantage of shooting downward into a backstop: the ground. 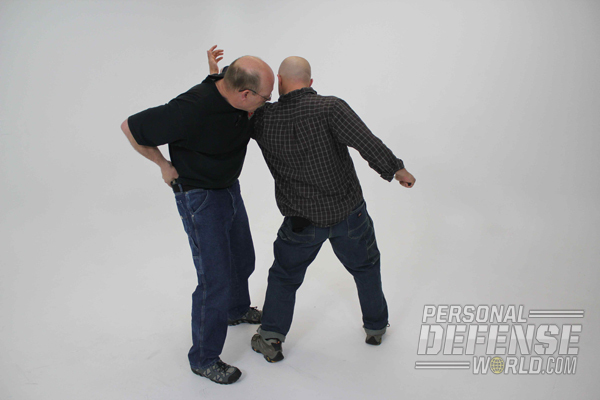 If your attacker is taller, or reaches toward your face with his left hand, reaching over his arm to control it may not be practical. Instead, use your right hand to slap his left hand across to your left. Reach your left hand under his arm and hook it behind his neck. Again, using your back muscles for maximum power, pull your left elbow back to your ribs. This will pull him in close to you and once again put you on the outside of his body, safely away from his knife hand. Hold on tightly and use your head for additional pressure if necessary. Then, draw your gun to a solid close-quarters index position and shoot to stop. If you’ve been reading this closely, you probably noticed that all the weapon draws I described were one-handed processes. 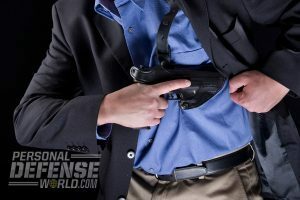 If your preferred carry or concealment method does not currently lend itself to a one-handed draw, fix that issue before you attempt these techniques.